What if there was no name-calling in schools? 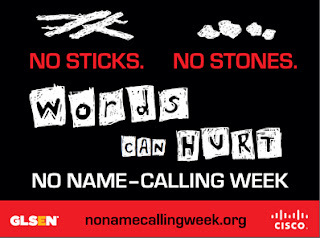 That's the aim of the annual "No Name-Calling Week" which starts today. Schools across the country are planning lessons and activities to help end name-calling. These efforts are also aimed at eliminating bullying. The "No Name-Calling Week" web site has lots of resources and lesson ideas. From art projects to a creative expression contest, there are many ways to participate. How about also making your home a No Name-Calling zone? Increase the respect in your home by eliminating name-calling!